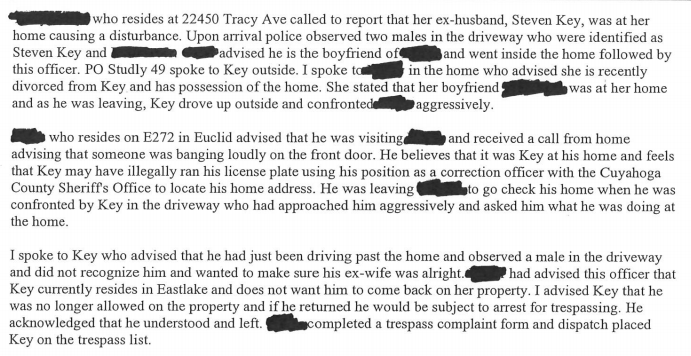 Update: Steven Key, a former supervisor at the Euclid Jail, which is run by the Cuyahoga County Sheriff's Department, has been under investigation for months now for allegedly misusing a police database to look up the license plate of his ex-wife's boyfriend to find his address. After doing so, he repeatedly visited the man's house. Misuse of LEADS can result in fifth-degree felony charges, and the preponderance of evidence (again, see original story below) showed both men willfully acknowledging that a) they were aware it was wrong and b) that they did it anyway. Jimson told Euclid police officers that Key, his supervisor, instructed him to look up the man's license plate and address. Key told Cleveland.com Jimson volunteered to look up the information. The Associated Press followed up today with news that the case was referred to the prosecutor's office on Wednesday. We'll update you as the process unfolds. 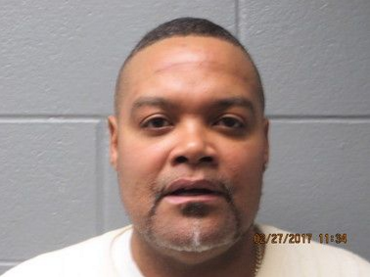 (Original story 3/3/17): Steven Key, a supervisor at the Euclid Jail, which is run by the Cuyahoga County Sheriff's Department, was arrested by Euclid police on a warrant for menacing by stalking. 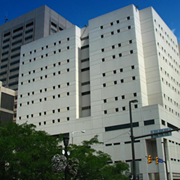 That arrest is tied to the investigations currently underway or wrapped up by the Euclid Jail and Cuyahoga County into alleged misuse of the LEADS law enforcement database by Key and Quincy Jimson, an officer at the jail. 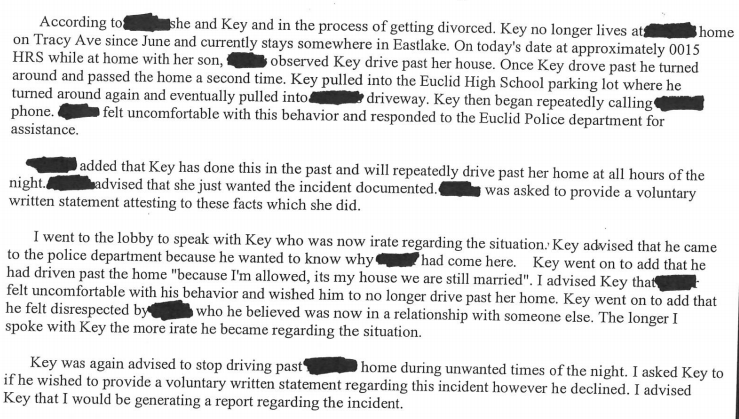 The narrative goes like this: Key had repeatedly visited the house he used to share with his ex-wife, against her wishes. She contacted police and noted that Key had previously driven by multiple times a day and stopped by, unwanted. The first complaints occurred in December, while Key and the woman were in the midst of their divorce. The next police report was made in early February after Key confronted his ex-wife's boyfriend at the house. After the male suggested that Key had misused his access to LEADS in his position as a Cuyahoga County Sheriff's Department employee, Euclid PD looked into that claim. Logs from the LEADS system showed that someone at the Euclid Jail had indeed run the plates on the car the male was driving. Video from that date showed that the plates were run by officer Jimson in the presence of supervisor Key. The video also showed Key disappearing from the jail, while on the clock, for about 30 minutes after the plates were run. During an interview with detectives, Key said he knew misusing LEADS was illegal but that this wasn't a misuse of the system in his opinion. 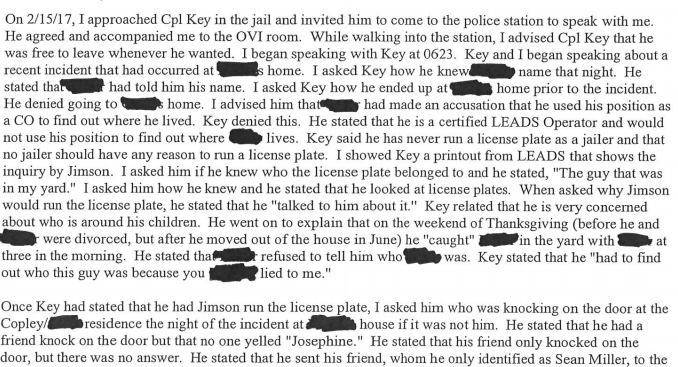 An interview with Jimson by Euclid PD confirmed that Key had requested that the officer run the plates. Jimson told an officer, after hemming and hawing about the exact reason he ran the plates, that it was the only time in 22 years that a supervisor had ever asked him to do so. Both Key and Jimson were transferred from the Euclid Jail to the county jail downtown after the incident. Cuyahoga County spokesperson Mary Louise Madigan today confirmed to Scene that the county's investigation is ongoing. Jimson remains on duty at the county jail; Key has taken leave/vacation.